The EPA Forum 2016 took place on 11 March in Madrid, Spain. 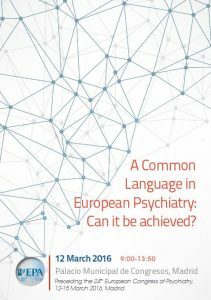 186 participants centred their discussion on the theme A Common Language in European Psychiatry – Can it be achieved? Speakers from the Commission, WHO and UN, as well as European psychiatric organisations and networks such as EUFAMI, GAMIAN and ROAMER, joined EPA leaders for topical lectures and discussions concerning matters of European importance in the field of Mental Health and Mental Health Care. ​European Psychiatry: What are the concepts? Can we find a common ground? European Psychiatrists: What unifies us – What is our role? What are core principles in education? European Research: Where should we set the focus?